The club joined the Eastern Counties League in the summer of 2002 following promotion from the Essex & Suffolk Border League. 2002/03 saw further progress for the Stoneylands club as they not only consolidated their place in the First Division, by finishing in a creditable final sixth position, but also won the Suffolk Senior Cup for the eighth time in their history, but for the first time in forty-eight years! Having dominated the Suffolk Senior Cup in the ‘fifties, with a hat-trick of wins over both neighbours Sudbury (twice) and Ipswich Town at Portman Road from 1952/53 to 1954/55, the county cup was always held dear by many at the Club. Since those halcyon days, the club has returned to Portman Road on three further occasions in an effort to regain the cup without success, but it was to be fourth-time lucky in 2003. The final was the icing on the cake for Long Melford and a fitting reward for co-managers Darren Pratt, Jason Stalker and their hard-working squad as they fired their way to a five-goal win over Suffolk & Ipswich League side Stanton in front of over twelve hundred. Looking back, history will tell us that the first record of the Club was as long ago as 1868 when Long Melford defeated Ipswich Rangers 5-1 and that the game was played on the Church Green. This period subsequently saw the emergence in the mid 1870s of such sides as Stowmarket and Ipswich Association (now Ipswich Town).One of Melford’s earliest players was capped for England. William Nevill Cobbold, who was born in Long Melford on 4th February 1862 and played in most of the Club’s earliest matches, represented England as centre forward against Scotland, Ireland and Wales between 1883 and 1888. In the 1887/8 season the Club played 15 games, won 13, drew one and lost one. Having beaten every team in the district they challenged mighty Ipswich Town to a match. Ipswich declined replying to the effect that it would be injurious to Ipswich’s prestige if they play “little village teams”. Ironically the sides subsequently met in the Suffolk Senior Cup, Semi-final in 1887/88. Ipswich, the Cup holders, were beaten 2-1. 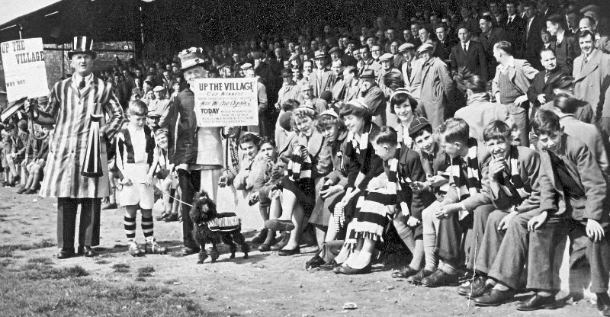 After this win one local paper carried the headline “What about the little village now?” Since that day the Club has often been referred to in football circles as ‘The Little Village’, hence our nickname “The Villagers”. More recently, the summer of 2002 saw the then members club vote for the club’s management and assets to be transferred to a Limited Company. From the 1st August 2002, the Club has been owned and managed by Long Melford Football Club (2002) Limited. The club enjoyed an excellent FA Cup run in 2004 in which Melford were eventually knocked out by Yeading (who went on to entertain Newcastle United) and in the same year reached the last 64 of the FA Vase. The period between 2005 and 2011 was undeniably tough for the club, with Melford consistently finishing in the bottom half of the table and failing to achieve any tangible success in the cup competitions. However, 2011/12 saw Melford finish in 9th position (their highest league finish in nearly a decade) and a return to Ipswich Town to contest the Suffolk Senior Cup Final in front of just under 900 spectators. Melford took the lead in the final but eventually lost 2-1 to holders Whitton United. The 2014/15 season was one of the greatest in the club's history as Melford achieved promotion and were crowned Thurlow Nunn First Division champions in front of 300 supporters after beating Downham Town on the final day. In 2015/16 the club's first ever season in the Premier Division (Step 5) exceeded expectations as Melford not only avoided a relegation battle but secured a top half finish (9th).